On 2 June 1958, young Kathakali dancer Govindan Kutty arrived at the Howrah station in Calcutta with his newly wed, 17-year-old dancer wife Thankamani Kutty. He had already spent four years in Calcutta teaching at Nritya Kairalee established by the Calcutta Malayalee Samajam. Subsequently Thankamani, a trained Bharatanatyam and Mohini Attam dancer, started teaching in a small way. At that time, the couple had no proper school of their own, but a chance unpleasantness with a student’s father—neighbour and Income Tax Commissioner—resulted in the checking of their accounts (which were not organised nor well maintained) which in turn led the couple to initiate steps towards formalisation of the classes and establish a school. It was a blessing in disguise. Govindan Kutty and Thankamani, both alumni of Kerala Kalamandalam, made the city their home and founded Kalamandalam Calcutta in 1968 to impart training in south Indian classical dances to students in Kolkata and beyond. Thankamani spoke only Malayalam but her intelligence and knowledge of “angika abhinaya” (by her own admission) helped her to quickly learn Bengali and later English which have now made her a dear “Aunty” to her thousands of students. Thus Kalamandalam Calcutta, established in a humble way, has grown into one of the prestigious and prosperous performing arts institutions of Kolkata. Revathi Ramachandran took charge as Director, Kalakshetra Foundation, on 20 April 2018. It was a welcome move as the post had been vacant for over eight months. A dancer, teacher, and choreographer, Revathi Ramachandran was a disciple of Mangudi Dorairaja Iyer and is known as an exponent of Suddha Nrittam—a temple art form revived by her guru. Before he passed away in 1980, he handed over her his mridangam and cymbals to her, which she treasures as heirlooms and a blessing. From 2001, on his death anniversary which falls in August, Revathi has been diligently conducting ‘Bhaavaarpanam’—a festival dedicated to his memory, featuring several dancers and dance forms. Her mother Jaya Venkataraman was a connoisseur of art. Her passion, encouragement and guidance helped Revathi reach a level of excellence in classical dance, after her arangetram in 1972 at the age of twelve. Revathi has assisted scholars like Dr. T.S. Parthasarathy, Dr. Arudra and Dr. R. Nagaswamy, in lecture demonstrations by presenting Suddha Nrittam and Tiru Tala Jati. 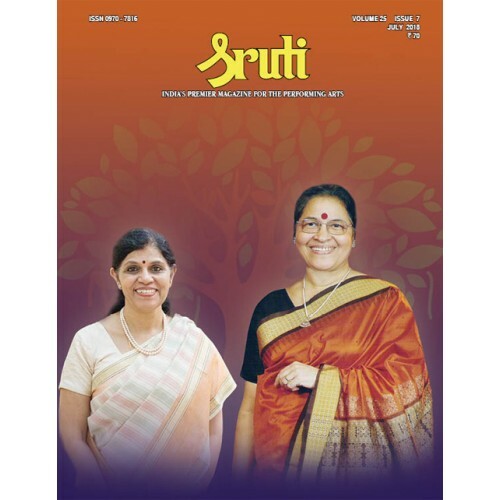 On a fellowship grant from the Ministry of Human Resources Development, Government of India, Revathi undertook research on the Bhagavata Mela tradition with specific reference to the ‘pravesa daru’ in the natakams. She was the first student to enrol in Kala Peetham, Chennai, where she learnt nattuvangam from Seetarama Sarma, Carnatic music and veena. She was a disciple of vainika Kalpagam Swaminathan. She also learnt Kuchipudi from Vempati Chinna Satyam and participated in his dance-dramas. KANCHAN SONTAKKE Kanchan Sontakke is a rare director and group leader who is publicity-shy in spite of her pathbreaking work in children’s theatre in India for over forty years. Kanchan studied science at St. Colomba and Elphinestone College and is a trained dancer. She founded Natyashala in 1981 and initiated a theatre movement using elements of music, dance and theatre to transform the lives of several physically challenged and special children. Natyashala has been a mentor to children with hearing and visual impairment, orthopaedic and intellectual handicaps, and to special educators in the field of creative dramatics, educational and therapeutic drama, vocal and instrumental music, dance, puppetry, rope-pole mallkhamb, arts and crafts. The institute has catered to over 25,000 children and 8000 teachers and has so far staged about 1300 shows of 79 plays. Natyashala’s cultural festivals like Balotsav, Umang, Jallosh and drama competitions have provided artists with disabilities a platform to display their talent and prove their merit. Natyashala has established a Rural Centre for Training and Rehabilitation through Performing Arts in Pune. Kanchan Sontakke’s use of performing arts as therapy, a mode of education and rehabilitation have been acclaimed by stalwarts in the field of education and culture. She is ranked along with Feisal Alkazi and Zarine Chaudhury for her pioneering work. She is an active member on several councils and is considered an icon for her passionate and sustained involvement in a unique form of creative drama which brings together children with disabilities and their able-bodied peers. M.E. Rambhau Bijapure was a pathbreaking harmonium exponent whose birth centenary was observed in 2017. His unique command over the instrument and unprecedented versatility went beyond harmonium playing to enrich Hindustani classical music. The prevalence of the harmonium in Hindustani music cannot be overstated. It is found in classical and light classical music, in film music, at the theatre, at places of worship, at mushairas, in street performances, and even funeral processions, among others. Affectionately referred to as “baja” or “peti”, the relatively recent import from Europe is practically considered an Indian instrument. Though ubiquitous, it remains largely underappreciated and has been typically kept within the confines of accompaniment. Several generations of Hindustani classical musicians have devoted their lives to exploring its capacities beyond accompaniment and developing a wide range of solo styles for khayal performance. However, few have so fundamentally altered the sound profile of the harmonium as did Rambhau Bijapure.